These pumpkin dinner rolls are light, fluffy, and perfect to serve along your next bowl or soup or Thanksgiving dinner with your family! The weather is getting cooler and I’m finding myself stocking my pantry with canned pumpkin. It’s an exciting time of the year when the weather here in Arizona drops from triple digits to double digits and the nights start to become slightly more enjoyable. While many other areas of the U.S. are stuck with jackets and wood burning fireplaces, here in Phoenix I’m just happy that we can enjoy better temps. 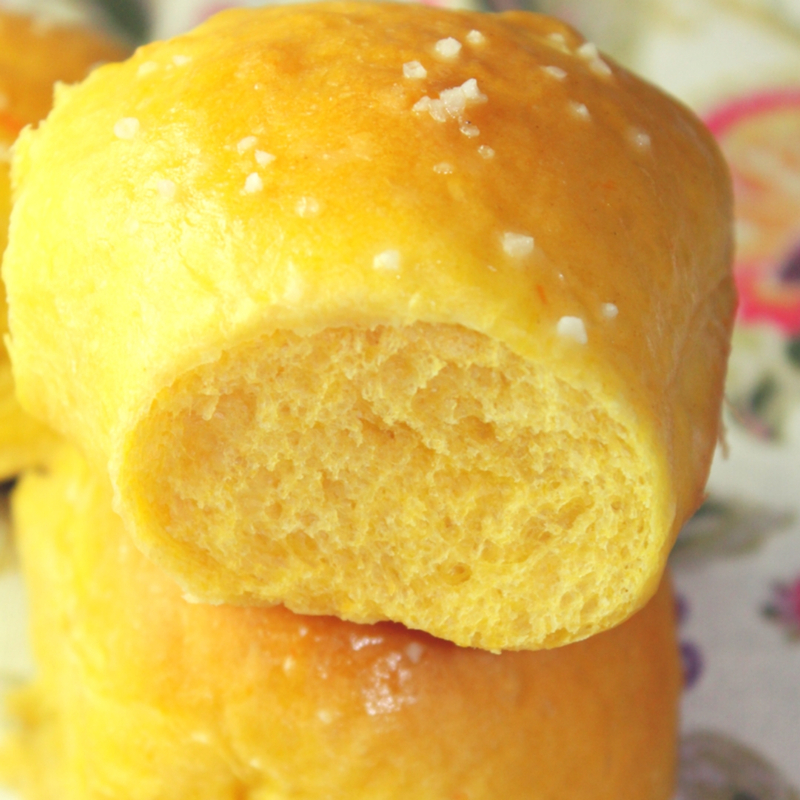 It’s time to pull out the crock pots, soups, and pumpkin everything – why not whip up pumpkin dinner rolls? Everyone knows that nothing compares to homemade rolls. 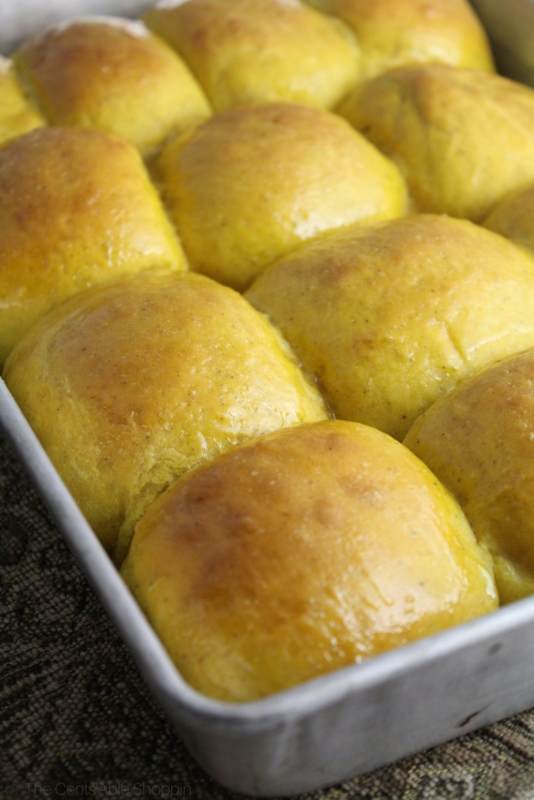 From homemade Sweet Potato Rolls to Carrot Dinner Rolls, even Molasses Steak House Rolls, they are perfect to have smothered with butter next to a warm bowl of soup. Or with your Thanksgiving turkey. If anything, they are a great way to use that half can of pumpkin you have lingering in your fridge. Ok that might be a stretch but it’s true – your kids will inhale the rolls with a little butter, telling you between bites that they are, indeed, so delicious. At least that’s what mine did and it was the perfect accompaniment to our Salsa Verde White Bean and Chicken Chili — yum! As with any homemade bread, a warm kitchen is on your side, and a 9×13 pan is your best friend. I use my 9×13 pan all the time, I could never live without it. Of course, the best place to find one is for $1 at the local thrift (which is exactly what I did!) or you can pick one up online too. Once you have one, I guarantee you will wonder how you lived without it. 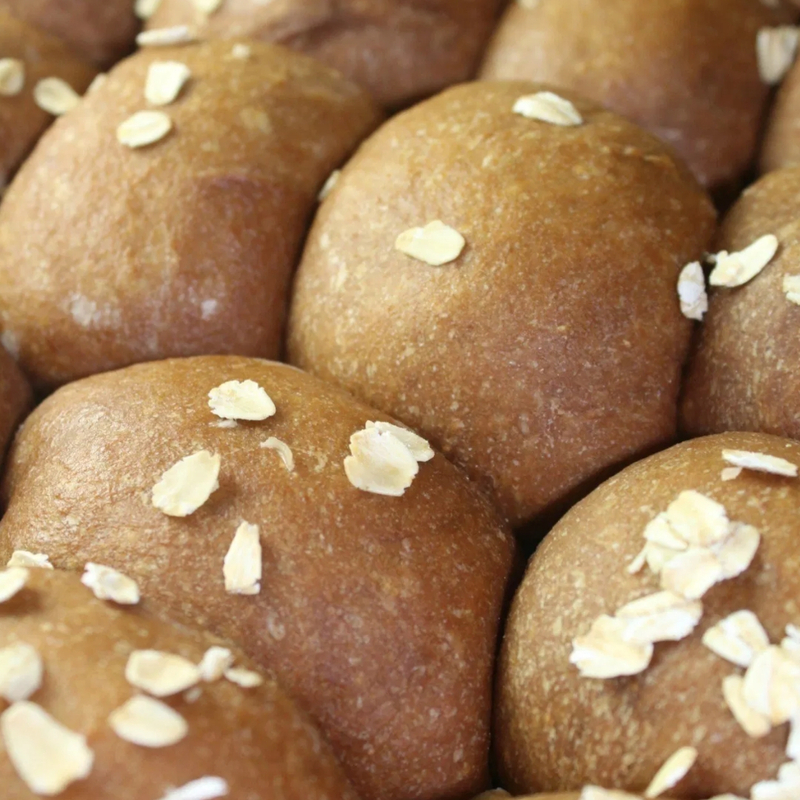 Give yourself a few hours at home to allow these rolls to do their thing. Then pop in the oven to bake, and enjoy the fruits of your labor with a warm bowl of soup. 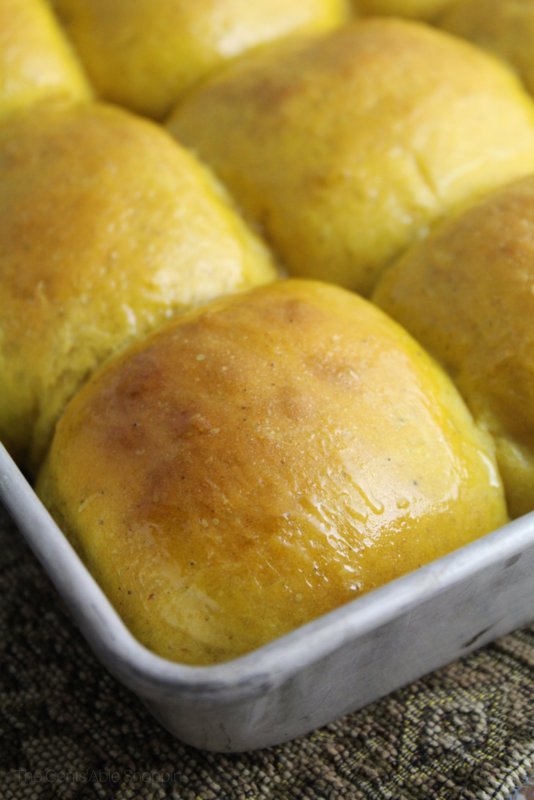 These soft pillowy Pumpkin Dinner Rolls are the perfect accompaniment to any family meal. Dissolve the water and yeast in the bowl of your KitchenAid and let stand 5 minutes. The mixture should froth/foam up - if it doesn't, toss and start over with fresh yeast. Add the sugar, pumpkin, eggs, butter, salt, and flour to the mixer. Using the hook attachment, stir to mix well - the mixture should pull away from the sides of the bowl but still be rather sticky. Oil your hands, then turn out the dough onto a lightly floured surface... knead for just 1-2 minutes. Shape into a ball and place in a well-oiled bowl - turn to coat the surface. Cover and rise 1 hour - until doubled in size. Punch down, let dough rest 1-2 minutes. Divide the dough into 12 equal sized portions. Form into rolls - pull the top/sides down and pinch under, placing the rolls seam side down in your baking pan. In the meantime, heat the oven to 350 degrees F.
Once the rolls have risen (30-40 min), bake 9-12 minutes or until golden brown. Optional: Combine the melted butter and honey in a small bowl. Brush rolls with the honey butter glaze before serving.